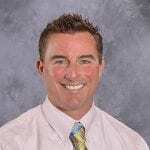 Meeting challenges head-on and encouraging others to do the same were characteristics that led Jason Lawson to become Principal at Lake Hills Elementary when he was only 34 years old. Those characteristics paid off, when during his second year as principal in 2014, the school was identified as a Michigan Focus School. The identification was due to high achievement gaps between its top 30 percent and bottom 30 percent of students. Many of the school’s challenges were clear. The school’s free and reduced lunch rates were rising, mobility rates were high, school funding was down, and the surrounding community was struggling economically. Never one to back down from a challenge, Principal Lawson got to work. By the 2015-16 school year, Michigan designated Lake Hills a Reward School for being in the top 5 percent of top-to-bottom rankings, making the greatest gains, and beating the odds by outperforming the school’s predicted ranking. Principal Lawson’s approach to meeting the school’s challenges is embodied in the phrase, “whatever it takes.” While that phrase is often used lightly, for Principal Lawson, it became a rallying cry to shift assumptions and innovate. He had to raise the expectations of all stakeholders, including students, administrators, teachers, parents, and the community. He quickly put his servant leadership style into practice and started asking questions and listening carefully to gain perspective. One of the first priorities was to change the overall climate and culture of the school. Principal Lawson worked with staff to shift to a growth mindset and to make lasting differences for all students. He dove into the research and asked for help from local experts. He organized a book study that engaged the entire staff in a process of self-reflection. Recognizing that a rallying cry alone would not effect change, Principal Lawson embraced the concept of Professional Learning Communities (PLC). He wanted to ensure consistent, concentrated, and collaborative efforts. He immediately created a behavioral support team and established grade level planning times one day a week. The time would be used to address essential questions, evaluate student data, discuss strategies to implement, and review prior work. Meeting monthly with each grade level team and the reading and math specialists, Principal Lawson approached the work with three guiding principles in mind: 1) Every child has the capacity for success. The school must meet students where they are and take them further than anyone expected. 2) We are at our best when we work together. No one person has the best approach in every situation. The PLC model encouraged creativity, innovation, and adaptation to issues that arose. 3) The principal’s role is to lead by example, work side by side with teachers, and maintain a positive, forward-oriented focus. Instituting a new approach to the instructional day was only part of the puzzle. Principal Lawson also understood that to close the achievement gap, he had to strengthen the bridge between home and school by meeting those needs as well. In addition to creating a welcoming, trustworthy place, he harnessed and empowered critical connections and resources to meet family needs. He worked with the Parent Teacher Organization and hired a parent engagement coordinator. He built relationships with families and addressed basic food and clothing needs. When Lake Hills was designated a Focus School, Jason Lawson modeled what it means to serve a school community and do whatever it takes. He embraced the challenge and inspired the school community to abandon old assumptions and propel Lake Hills forward to become a National Blue Ribbon School.